In MCPE 0.11 were added effects, but they are not in a single game craft. 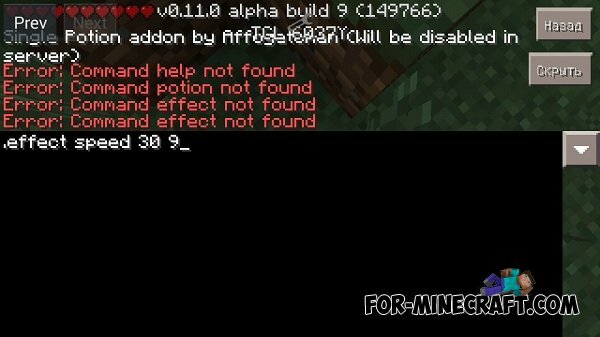 Affogatoman from MinecraftForum solved this problem by creating an addon. .effect - without parentheses and quotation marks! For example: .effect invisibility January 30 - gives the effect of invisibility by thirty seconds. Effects walk mod for MCPE 0.10.5The mod adds effects to the player while walking, which look very nice. According to the author is the most beautiful diamond. Worst website ever i cant get a single mod.